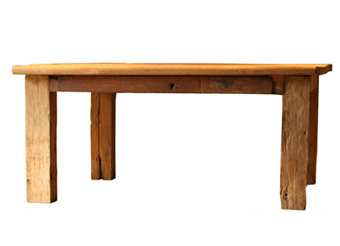 Each of these reclaimed teak tables have a unique sculptural quality as the antique timber used varies from table to table and some are more like wooden sculptures than wooden tables. 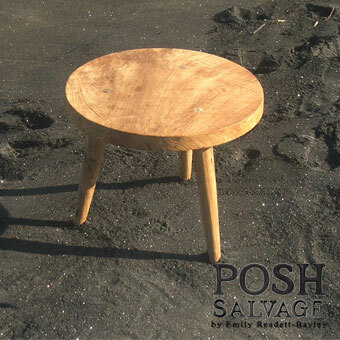 They are handmade from thick pieces of rare antique teak salvaged from Colonial Javanese bridges and buildings and carefully put together by highly skilled Javanese craftsmen who work with Emily Readett-Bayley on the Indonesian island of Bali. 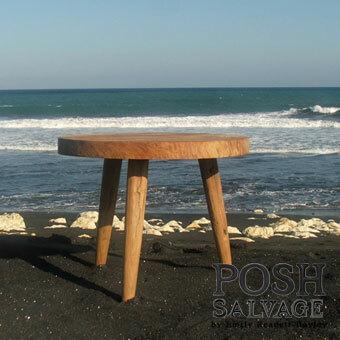 Antique teak is extremely durable and the wood is resistant to salt so it is ideal as a beach table or on a seaside terrace. 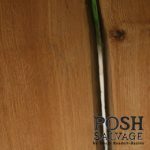 Antique teak fades to a distinctive silver grey when used as garden furniture so has the added advantage that there is no need to oil it, it has a beautiful natural patina. 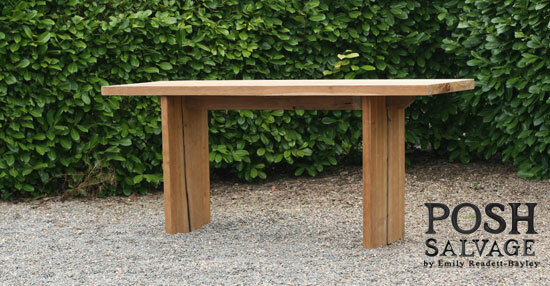 We have a limited amount of stock teak tables on offer and Emily can also make teak garden tables to order but be aware that this top quality salvaged teak is becoming increasingly rare and expensive as the new teak grown is not as strong as it grows much faster. Snap up a bargain, they are the antiques of the future ! 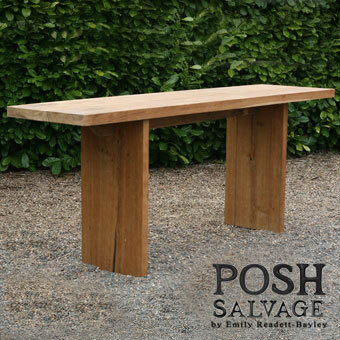 To celebrate the RHS Chelsea Flower Show week Emily Readett-Bayley is offering 30% off the last of her antique teak garden furniture that has been so admired on her stand at Chelsea in the past. 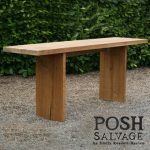 Old teak is a rapidly diminishing resource and each of these unique pieces of furniture, made from particularly large planks and pillars, will not only last for a very long time in your garden they may also become the antiques of the future. Old teak wood has the highest oil content of all wood and although it fades to a beautiful silver grey out of doors this furniture does not need to be treated with oil or wax. It is also resistant to salt which is why it is used for decking on boats,although, if you have the space to move the furniture under cover when it freezes in winter it is never a bad idea. 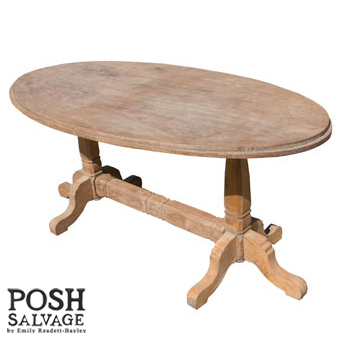 A beautiful antique teak oval table with stretcher. 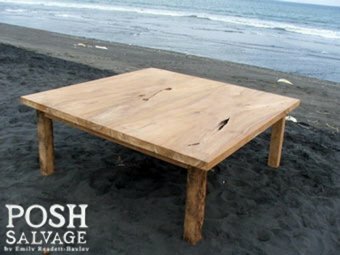 We do not finish the teak because the wood is so beautiful in its natural state and sometimes we deliberately leave holes. If you wish to seal a piece for interior use we recommend OSMO wax. Outdoor furniture can be oiled with teak oil but it will change the colour of the old teak. 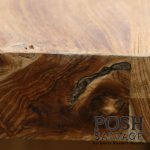 A large “almost square” reclaimed teak table made from two very old and rare teak planks which are unusually wide and thick with a beautiful grain. The legs made from old teak pillars and are a seriously chunky 15cm square. 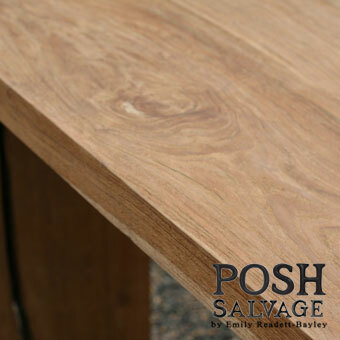 The edges of the table top are weathered smooth with two sides being quite rounded and the whole table is full of natural sculptural details. 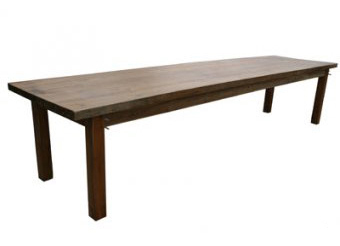 A VERY LONG table made from exceptionally rare lengths of reclaimed teak. The table has a smooth surface finished with a matt lacquer but this can be sanded down to the original teak surface and finished with OSMO wax if required. 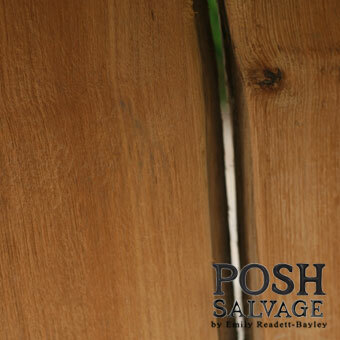 Outside the wood would fade to the distinctive silver grey of weathered teak. 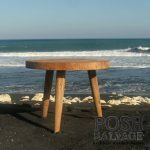 This table is made from a rare Indonesian hardwood species, known locally as Bali teak, reclaimed from an old building on the island. 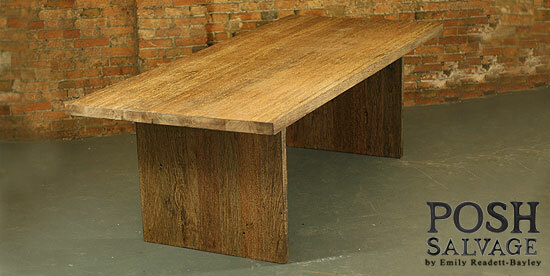 It is very hard and very heavy and is much darker than Javanese teak. 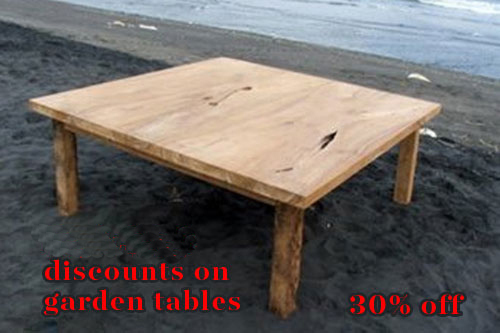 This table is suited for indoor or outdoor use. We have 3 tables made of this rare wood. 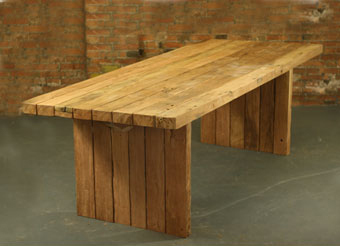 A pair which are 2.5m long and one table which is 3m long. 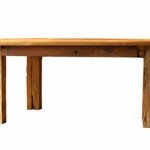 Prices are determined by the weight, thickness and quality of the wood used. Old teak is sold by the cubic meter and the price is going up all the time. Once it is gone it is gone. Teak of this quality is not grown anymore. 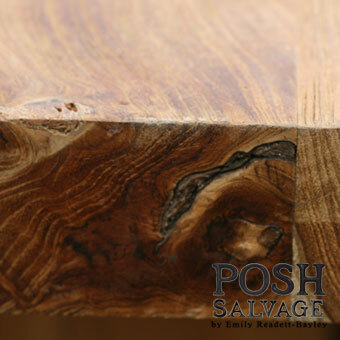 A beautiful console table made from lovely thick pieces of good quality teak.